In this video game, a plane crashes in the midst of Jurassic Park one year after the incidents of The Lost World. Now the sole survivor, Anne (voiced by Minnie Driver), must free herself from this position and make it off the island. There are no health bars, ammo displays, or power-ups, and players can't pick things up just by walking over them. Instead, interaction with the environment is done using Anne's arm, which can be moved around using the mouse and which can be used to pick up items, throw rocks, push down crates or wield weapons. Anne's voice gives a rough estimate of the amount of ammo left whenever she wield a gun, and Anne has a heart-tattoo that fills with red as she becomes more damaged. By pressing a key, Anne will extend her arm out in to the game world, allowing the player to pick up, swing, push and throw objects. This allows the player to create improvised weaponry, for instance: grabbing a large rock off the ground and bashing a velociraptor with it. However, this feature is extremely cumbersome, as it requires up to five buttons (maximum) to be pressed to fully manipulate the arm (picking up, dropping, moving, swinging, and rotating). This makes u tilizing the arm in the heat of battle somewhat frustrating. Anne can only carry two items at once and when bumping into things will often drop items. 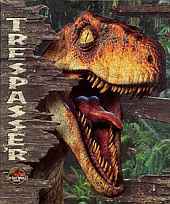 In a lot of areas, Trespasser is very realistic. It was the first 3D game to incorporate actual physics in the gameplay into how objects can be used and change very accurately. Nevertheless, the game's fun is low. The dinosaurs are silly (maybe realistic, however there is no particular fun in dealing with them) and are seen rather rarely. The levels are generally boring. The graphics are bad and that's just a few of the downsides to the game. Maybe some guys will get a thrill when looking down, your female character obviously has breasts. Hehehe.